The summer of 1860, Mr. Blackwell of England proposed to Illumination of the Falls in honour of the upcoming visit from the Prince of Wales. By using 200 Bengal Lights, he arranged a row of 60 of these lights below the high bank on the Canadian shoreline aimed at the American Falls. Blackwell placed another 60 lights under the Table Rock and then the remaining 80 lights were located behind the water of the Horseshoe Falls. At 10 p.m. on September 141860, both the American and Horseshoe Falls were fully illuminated for the first time in history and also in the presence of the Prince of Wales. Although successful, Blackwell’s method of illumination wasn’t utilized for other shows after. In the late 1860’s, calcium “torpedo” lights were utilized to illuminate portions of the gorge at night. In 1879, Niagara Falls was again illuminated for the Royal visit of Princess Louise and her husband, the Marquis of Lorne – Governor General of Canada. This was another historic event as it was the first time in history that the Falls were illuminated by use of electricity. The Brush Electric Company of Cleveland, Ohio used arc lights to illuminate the Falls. A water wheel, located in the rapids upstream of the American Falls, was connected to a dynamo type generator capable of producing 36 horsepower of electricity to 16 arc lights. Twelve of the lights were pointer at Prospect Park while the remaining lights were used to light the base of the American Falls. During the 1901 Pan American Exposition in Buffalo, New York, the Falls were illuminated with spotlights to attract attention of visitors at the Exposition. In 1907, William D’Arcy Ryan of the General Electric Company of Schenectady, New York designed a new light system to illuminate the Falls. 36 new lights had the strength of 1,093,815,000 candela (a unit of luminous intensity) were mounted along the Ontario Power Company access road immediately north of the Ontario Power Generating Station near the base of the gorge. They were aimed at the American Falls and coloured gelatin film was placed in front of the light to project colours upon the American Falls. On October 9th 1907, the Falls were illuminated during a visit by the Duke of Cornwall and again on October 18th 1919, during a visit of the Prince of Wales. In 1920, lights were installed on the roof of the Ontario Power Generating Station located at the base of the Niagara Gorge to light the American Falls. Additional lights were mounted on the Table Rock House to illuminate the Horseshoe Falls. All the lights were strategically located to conceal their location. During the early 1920’s, a group of businessmen from Niagara Falls, New York formed a group that became known as the “generators”. This group began lobbying officials of both American and Canadian Governments to improve the illumenation of the Falls. The “generators” group had raised $58,000 for the purchase and installation of twenty-four new arc lights. Each light has a diameter measuring 91 centimetres. 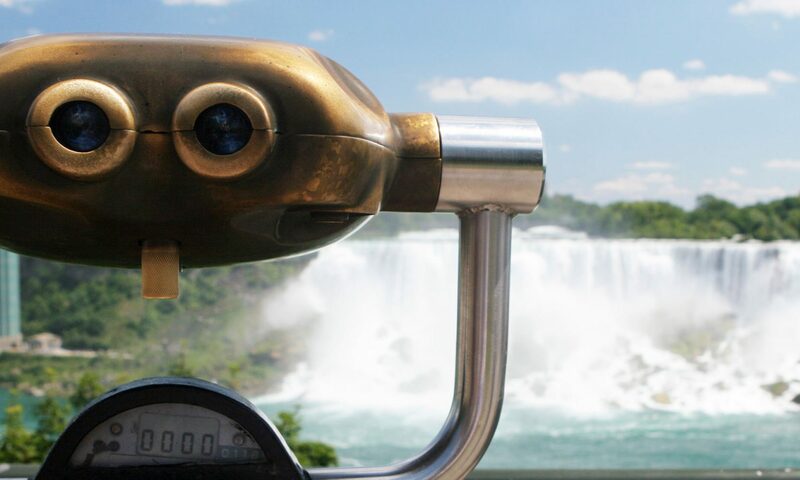 On February 24th 1925, the Niagara Falls Illumination Board was formed. The board had an initial budget of $28,000 to ensure the management, operation and maintenance of the illumination lights. The power to supply the illumination lights were being provided for free by the Ontario Power Company. Twenty-four new lights were mounted in a row on the Ontario Power Company water surge tank, located next to the Refractory (Victoria Park) Restaurant on the Canadian side allowing both the American Falls and Horseshoe Falls to be lit from the same location. Each light used 4,500 watts and produced 54 million candela, while the series of lights produced 1.3 billion candela. These lights were originally built to search the sky for enemy aircraft over Britain during World War II. The official ceremony took place on June 8th 1925. It included a light parade in Niagara Falls, New York followed by an International ceremony in the middle of the Upper Steel Arch Bridge before the lights were turned on to illuminate the Falls with many spectators looking on. On June 20th 1958, 20 new carbon arc lights were installed by the General Electric Company of Canada at a cost of $153,000. Ten lights were aimed at the Horseshoe Falls, five lights were focused on the American Falls and the remaining lights were either aimed at Goat Island or the Upper Rapids. Each of the new lights produced 4.12 candela, and all of them generated 82.4 million candela. By 1974, 20 Xenon gas spotlights were put into use. Each light is 76 cm in diameter and each generate 245 candela. As part of a 1997 upgrade, work began to replace old illumination lights with a new 21 light system that will allow 60 – 70 percent more illumination. At a cost of $150,000 the first ten lights were replaced during that year, which use only 4,000 watts. Five more lights were replaced with the much brighter and more economical new lights The light shells are made of aluminum.The remaining eleven lights were replaced in 1998. Today illumination of the Falls occurs every night throughout the year. This illumination project continues to be administered and funded by a five member International Board known as the Niagara Falls Illumination Board. The current illumination lights were designed by OSRAM GmbH of Germany, one of the world’s leading lamp manufacturers. OSRAM designed and installed a whole new system of night time illumination for the Niagara Falls. These lights use 4,000-watt OSRAM XBO xenon short arc lamps that highlight the constant haze of spray and vapour, causing the falls to shine in every color of the rainbow. The new lamps produce twice as much light as the previous lighting installations and consume 10 per cent less power. Today, the 21 low voltage illumination lights generate an enormous 8 billion candela. The entire operation is run from a small control panel in an elongated room overlooking the illumination lights. The operator will change the lights by manually turning a series of red, blue, green, and yellow colour coded round shaped toggle switches. With each turn of any of these switches, a large coloured panel above the actual light drops down or rises up in front of the lights to create the rainbows of colour shining upon the Falls. Power is supplied by the City of Niagara Falls Hydro Commission. It is estimated that the cost of illuminating the Falls including the services of an operator is approximately $85 per hour.